After six years of communal agonizing over the LUCE and then another five spent on a new zoning code to implement the LUCE, is there finally a working consensus on what projects can be built in Santa Monica? Based on actions the Planning Commission took last week, the answer may be yes. Could our long local nightmare be over? 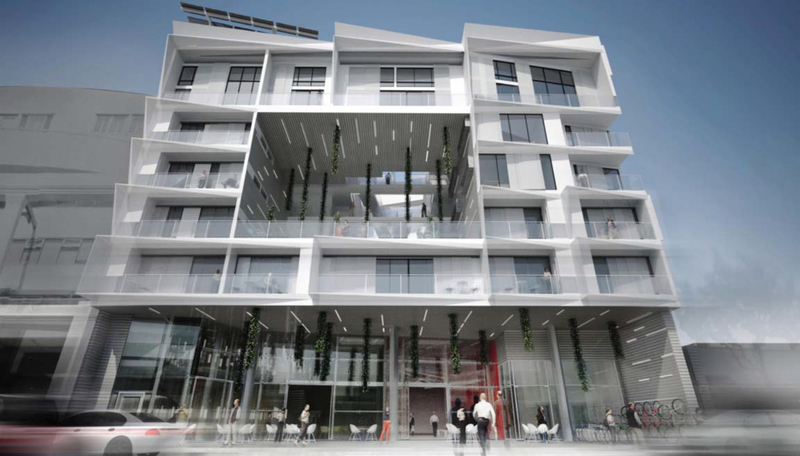 As reported here and here and here, the Planning Commission last week approved two mixed use (retail on the ground floor, housing on the floors above) projects downtown that would together add 163 needed apartments to Santa Monica’s inventory of housing. These are the first significant projects to come before the commission under the LUCE and since approval of the zoning ordinance, and since two new commissioners took office who were recently appointed by the slow(er) growth City Council majority. 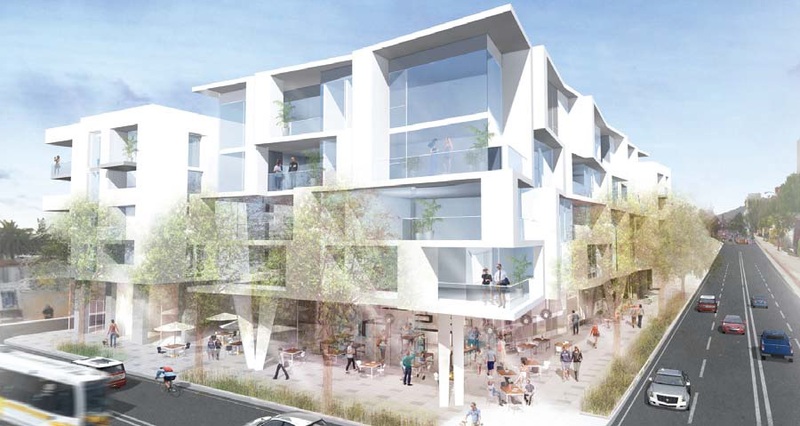 One project, on the block of Fifth Street between Santa Monica Boulevard and Broadway, is about 52,500 square feet of development on a double lot (i.e., on 15,000 square feet of land). The other, on the northwest corner of Lincoln and Colorado, is about twice the size, 102,500 square feet, but sits on five lots (37,500 square feet of land). The Fifth Street project has a height of 84 feet, the Lincoln Boulevard project would go up to 60 feet. Both projects require development agreements, and thus final approval will rest with City Council. The Planning Commission voted 4-1 to forward the Fifth Street project to City Council (two of the seven commissioners were absent). The no vote came from new member Mario Fonda-Bonardi. His no, however, was a vote on principle against the 84-foot height (he wanted it reduced 10 feet), and otherwise he didn’t have big problems with the project. The vote for the Lincoln Boulevard project was a unanimous 5-0. It’s significant that the majorities in favor of both projects included commissioners Richard McKinnon and new commissioner Nina Fresco, and the Lincoln Boulevard project received Fonda-Bonardi’s support as well. (Fresco and Fonda-Bonardi were both attending their first commission meetings.) McKinnon is generally identified with the slower-growth side in local politics. The development politics of Fresco are not well known, but the self-described slow-growth majority on the council appointed her to the commission. Fonda-Bonardi is strongly identified with anti-development views because of his being part of the S.M.a.r.t. group that writes for the Daily Press (even though, in a column he wrote, he advocated for the same rate of housing construction forecast in the LUCE, about 250 units a year). The votes made it clear that at least certain kinds of projects are going to have support from a broad spectrum of Santa Monica politics. It’s worth looking at what the two projects had in common, beyond the fact that under their development agreements, the developer (NMS in both cases) had agreed to substantial community benefit packages and affordable housing. Are located downtown, i.e., convenient to transit, and are otherwise designed to reduce environmental impacts, with LEED-platinum certifications, solar panels, and mechanisms for reducing water and energy use. Both projects would replace low-slung, suburban-style commercial buildings and surface parking primarily with housing. All the current council members, even those who identify themselves as “slow-growth,” recognize the need to build housing, given the region-wide shortage and market demand that’s pushing rents and housing prices to record highs. Are characterized by good, contemporary design that maximizes public space and avoids “boxiness.” The Fifth Street project, designed by local architect Michael Folonis, creatively re-considered the use of setbacks, and instead of wasting them in a wedding cake design that would leave a monolithic street frontage, used the required cubic feet of the setbacks to widen the sidewalk in the front of the building into a mini-piazza and to create a “donut hole” in the middle of the building that will better open the façade to the street. The Lincoln Boulevard project, designed by local architects Killefer-Flammang, will create a similarly widened sidewalk/plaza area at the important corner of Lincoln and Colorado and a paseo coming off Lincoln. Adhere to the City’s new standards for unit mix, to encourage more two and three bedroom units. Also, by breaking up the buildings with ground and upper floor open space, the architects have been able to give the apartments more light and air. The amount of development in both projects also reflects de facto downzoning downtown, since under the pre-LUCE development standards residential square footage was discounted 50% when determining the amount of development allowed. Perhaps ironically it’s the regional and local housing shortage and the resulting high rents that enable these projects, with their community benefits and reduced size. Projects like these two mark and are consistent with 60 years of changes that have made Santa Monica a “post-sprawl” city. While there will be battles to come over big projects, while one wonders what’s going to be built on the boulevards, and while Residocracy may float an initiative that would ban nearly all development, nonetheless there are encouraging signs of an emerging consensus on what will work for Santa Monica’s future. This entry was posted in Uncategorized and tagged downtown Santa Monica development, Killefer-Flammang, Mario Fonda-Bonardi, Michael Folonis, Nina Fresco, Richard McKinnon by Frank Gruber. Bookmark the permalink. When discussing housing its not a zero sum game either. Someone renting one of these units won’t incentivize the displacement of existing residents. New stock allows for pressure to be relieved on existing neighborhoods where right now its a Lord of the Flies situation in some cases, with owners chasing newer market rate rents. Where is the affordable housing component in this proposal? You really don’t talk about it here as far as I can see. Well it seems to me is that we are building new apartments at expensive rents for people with a lot of money. Victor — I mentioned it in passing since it’s sort of a given at this point, but both projects are about 20% affordable, most of which are at very low income levels (50% of median household income). Frank, “…all things being equal will be attractive to people who already work in SM and commute here from somewhere else, thus removing cars from rush hour traffic.” Such a leap of faith. Can you quantify the number of employees currently on site, and their commute habits, and compare it to the number of employees that will be necessary to staff and maintain the businesses and the units, and where they will be commuting from? Can you further show how this in any way brings to parity the jobs/housing imbalance, and more specifically how it solves the low/moderate/affordable housing problem. Bob — the Fifth Street site has two floors of retail and office, and the Lincoln site has a Denny’s. You don’t think they have employees and that those businesses don’t generate traffic? The block my dad lives on, 6th Street b/n Colorado and B’way, is now lined with small scale ground floor retail and business, just like what these buildings will have. There is hardly any traffic on the street, certainly hardly any from those businesses. Based on its parking lot, Denny’s attracts more car traffic than all the businesses on these new projects will. The fact is that there has been a ton of ground-floor retail built under apartment buildings over the past 15 years in DTSM and there’s no indication they have had any impact on traffic. OK, this kind of development looks promising. Thanks for the solid reporting on this, Frank. Perhaps if the city goes along more on this path, we can reduce some of the contentiousness. There is still the question of choking traffic. How about auto accommodations here? Rodney — keep in mind that both projects are replacing uses that already generate traffic, and replacing them mostly with apartments that all things being equal will be attractive to people who already work in SM and commute here from somewhere else, thus removing cars from rush hour traffic. It’s certainly not apartments downtown that make the weekend traffic jams as people head to the beach, etc.